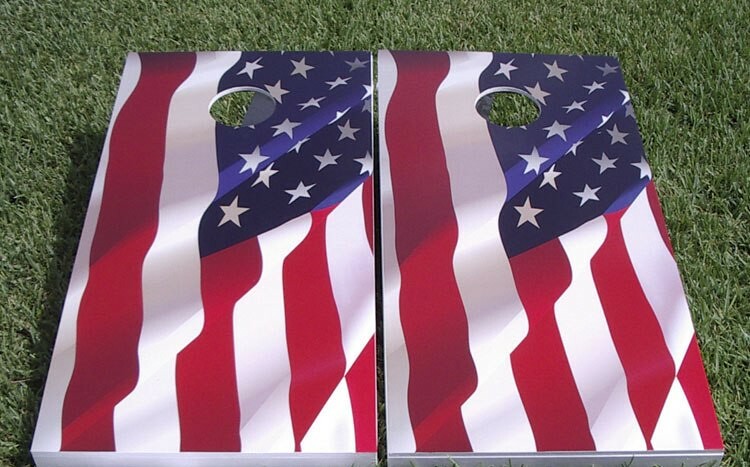 With the Fourth of July on a Thursday this year it is likely a few of you are taking some extra days off for a little family vacation. That means you’ll likely have a good opportunity to teach/play games with people who probably don’t typically play games. So today I present a short list of games that are accessible and enjoyable to gamers and non-gamers alike. This game looks like a really fun game to try out with your family. And since fireworks are so appropriate for the Fourth of July weekend I just had to add it to the list. Here’s how I teach Carcassonne: Take a tile and lay it down. This game is so simple from a mechanics perspective and yet their is so much depth in your decision of where and how to place the tile and then whether or not to put a meeple on it. That’s what I love about games like this: simple mechanics with deep strategy. With just the base game this one definitely can appeal to non-gamers. Add in the Inns and Cathedrals expansion and it adds some depth. My favorite expansion is Traders and Builders where you’ve got wheat, beer barrels, and Fruit by the Foot to gather up for more points. This game is just such an easy game to teach and play that I love to bring it along to family gatherings. If you really want to spruce it up try visiting the Mating Hut! This game can give non-gamers a little bit of component overload. But teaching them how simple it is to play will get them going in no time. As a bonus, have them smell the cup. If you own the game, you’ll understand! Our founding fathers were building a kingdom (of sorts) when they signed the Declaration of Indepence, so what better weekend to try this game with your family? Kingdom Builder is another game that is really easy to teach and play. On your turn you basically place three settlements on the board. Based on where you place them you may or may not have earned points (which get scored at the end). If you place a settlement by a special location then you have earned an ability which can help you the rest of the game. This game has a rulebook that is easy to follow and is quick to learn. I also like the cool boards in the game and the replayability (I know some people won’t agree with me on that… oh well). I’ve probably played it 30 times and it hasn’t gotten old to me, though owning the Nomads expansion helps. That means the game moves along pretty quickly. And this game is a lot of fun. Players work toward connecting their routes. The inevitable blocked route will occur and someone may get a little grumpy. But the bottom line is that this game is so easy to introduce to non-gamer family members that you might just convert them into a gamer! So there’s my round-up of the best games to play with your non-gamer friends and family this holiday weekend! Grab that palino and huck it! The palino is the name of the small white ball. One player tosses the palino and then players take turns bowling, tossing, chucking, heaving their bocce balls toward the palino. The players closest to the palino score points. This game also provides a fun way to give people a tour of your yard. If your yard is weedy and gross, maybe skip Bocce. Growing in popularity, this fun tossing game involves players throwing strings with balls on the ends at makeshift ladders, usually made from PVC. Players score points based on which rung of the ladder the string and balls land on. You can build yourself a set of this pretty easily. But if you choose to drill through golf balls, don’t smell the burnt plastic inside. I almost passed out by doing that! If you squint it looks like a monster with a serious underbite! We have the Vikings to thank for this game. Apparently they were into tossing things as well. Weird how all these outdoor games involve throwing things. Perhaps I should have added Croquet to the list to mix it up a bit. 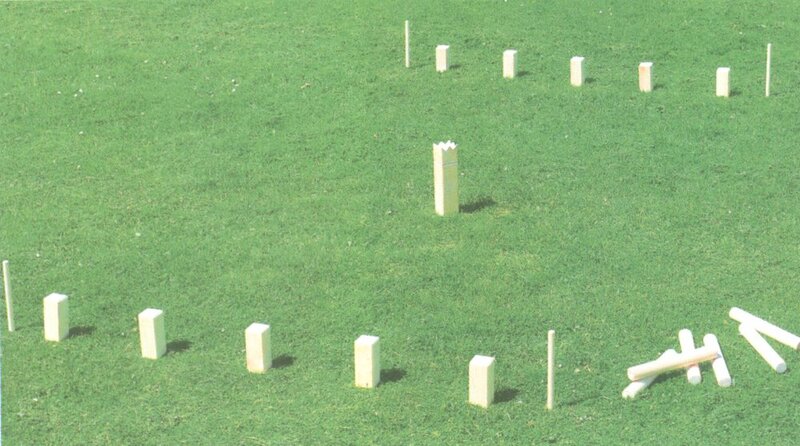 Kubb is a game where you throw batons at chunks of wood. Your objective is to knock down all of your opponent’s kubbs and then knock over the king. This game is a lot of fun because of the ability to stack the kubbs when they’re knocked over. It takes a while to play, but time with family is always worth it, right? Just ask your crazy uncle! Thanks for reading! I hope that you get in some nice quality gaming with your non-gamer family and friends this holiday!